CIMB Group is inviting applications for the inaugural CIMB ASEAN Scholarship 2016, open to citizens of five ASEAN countries i.e. Malaysia, Indonesia, Singapore, Thailand and Cambodia, which are also CIMB’s core operating countries. The scholarship is for full time undergraduate studies at any reputable university in the world. Applicants should have excellent academic results for their pre-university examinations/assessments (e.g. Sijil Tinggi Pelajaran Malaysia, A-Levels, International Baccalaureate or their equivalent in their respective countries) and have applied for their preferred university (they should have received an unconditional offer at the time of the award). The CIMB ASEAN Scholarship is a full scholarship covering all academic fees including registration, tuition and examination, book allowance, as well as other expenses such as accommodation, airfare, travel documents and other related expenses. 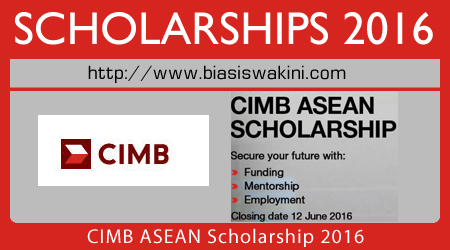 CIMB Group will give out 20 scholarships in 2016. 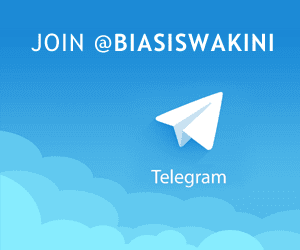 - Be a citizen of one of these countries: Malaysia, Indonesia, Singapore, Thailand or Cambodia. - Be aged 24 or below. - Academic excellence at pre-university exams/ assessments; the assessments may be country-specific/ local or foreign/ international. Indicative only: 3 A-Levels that include two distinctions. - Have applied for undergraduate studies at a reputable university anywhere in the world. You must have an unconditional offer from the university by the time the scholarship is awarded. - Have excellent results at the undergraduate level if you are already in your first or second year of university. - Not a holder of any other scholarship or grants that come with contractual obligation on the part of the applicant. The CIMB ASEAN Scholarship is a full scholarship award covering all academic fees including registration, tuition and examination fees, book allowance, as well as other expenses such as accommodation, airfare, travel documents and other related expenses. The CIMB ASEAN Scholarship will sponsor studies that are relevant to the banking and financial industry. The list below is not exhaustive. If your chosen discipline is not listed, just tell us why your discipline is relevant. The closing date for application is 12 June 2016. The information you provide will only be used for the purpose of evaluating your application for the CIMB ASEAN Scholarship. Do not submit copies of certificates, offer letter, commendation letters or any other document at this moment. Only applicants who are shortlisted for the next round of assessment will be required to produce the original copies of relevant documents. 1. You must register via the system using your email address before you can start filling up the form. Please do not register more than once. 2. The online application system allows you to save your application along the way. You will only need to click ‘Save and go to next’ button at the bottom of the page to save the completed sections. You may log in again using your registered email ID and password to continue later. 3. Ensure that you click ‘Submit’ when you have completed your form. Otherwise, it will remain as draft and will not be considered as submission. 0 Komentar untuk "CIMB ASEAN Scholarship 2016"